In this post I’ll explain how decisions are made in the EU, how democratic or undemocratic it is, and how corrupt (or not) it is ; and then a discussion of the same for the UK government. 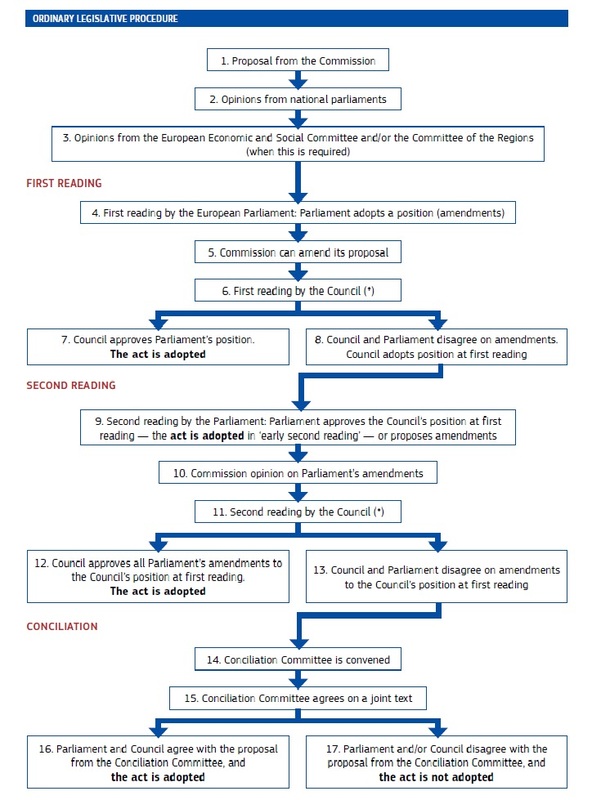 How the EU works – How democratic (or undemocratic) is it? The EU has four main decision making bodies – the European Commission, the European parliament, the European Council and the Council of Ministers. The European Council is made up of all the elected heads of government (Prime ministers or Presidents) of EU member countries, plus the President of the European Commission. Candidates to be President of the Commission are selected by the European Council by Qualified Majority Voting (meaning larger countries get more votes based on their population). Then the European parliament, (made up of MEPs elected in every EU member country, by the Proportional Representation voting system), votes to approve or reject the candidate for President of the Commission. Then each country’s government gets to put forward candidates to be commissioners. The Commission President assigns potential offices to them (e.g Commissioner for agriculture) and the European parliament votes to approve or reject them, until enough have been approved that all offices are filled. The Councils of Ministers are made up of ministers from member governments of the EU. E.g The Council of Ministers when dealing with EU agricultural policy or laws would be made up of the Agriculture Ministers of all national governments in the EU. Votes by any Council of Ministers are also usually by Qualified Majority Voting. The European Commission can put forward proposals for EU laws (regulations). Usually any EU law (‘Regulation’) the Commission propose has to be voted on by the European Council (if a very controversial or major issue), or else the relevant Council of Ministers, and also by the European parliament. The European parliament can also vote to amend (propose changes to) the proposed law. If a majority of the parliament and a majority of the Council vote in favour of the law, it becomes EU law. If not, it does not. 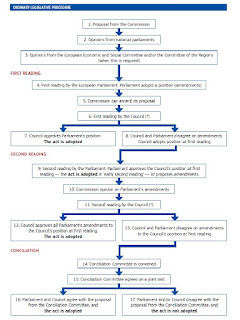 This is called the “Ordinary Legislative Procedure” – shown in more detail in the picture at the start of this post - you can click on the picture to enlarge it. There are some ‘Special Legislative Procedures’ in which the Commission and the Council are the only ones involved in making a decision on an EU Regulation, with the European parliament only consulted on its views. These are only used rarely and can only be used in certain policy areas. Then there are EU Directives, which are made by the Commission, and in theory require no one else’s approval to enter into force. In practice though national governments can decide how to implement them. Also in practice a country’s parliament can choose not to implement a Directive by voting to “derogate” from it, as Ireland’s parliament did over the First Railway Directive, although the EU sometimes takes legal action against and tries to sue member governments for not implementing Directives (though the European Court of Justice does not always rule in the commission’s favour). International Treaties (such as the extremely controversial Trans-Atlantic Trade and Investment Partnership or TTIP which the EU and US governments are negotiating on) are negotiated on by commissioners, but on a mandate given to them by the Council and parliament, and must also be ratified by majority votes for them in the European Council and Parliament, and by national parliaments also before they can come into force at EU or national government level. This is all very complicated, confusing, blurs who is responsible for what ; and far too much of it happens in secret (with the media banned from most meetings of the Councils and Commission, but allowed in the European parliament). Even MEPs can’t make any photocopies of documents on the details of TTIP negotiations to show to anyone else for instance (1). However the EU, despite not being nearly as democratic as it should be, is far from being “completely undemocratic” as many of the its critics allege. Three of the four main decision bodies are elected, and in practice no EU Regulation or Directive can pass without the approval of elected bodies. Nor can “unelected bureaucrats” (i.e European Commissioners) make any decision without elected representatives voting to approve them (or to reject them so they aren’t implemented). How corrupt or influenced by big banks and firms is the EU? For instance European Commissioners and their advisers are often former employees of big companies such as Exxon-Mobil – and some of them draw up EU energy and environment policy (4). The head of the European Central Bank, Mario Draghi, is a former executive at Goldman Sachs bank. Many other politicians and central bankers in Eurozone countries, have gone back and forth between senior positions in government, and being paid advisers to or executives of Goldman Sachs and other large banks (5). It seems unlikely to be coincidence that the EU has issued 1 trillion Euros of ‘Quantitative Easing’ money to private banks, but won’t issue any to pay off debts of countries like Greece (6). And around a third of European Commissioners, on finishing their time in office, go into jobs working for big banks or firms (7). These are just examples, not an exhaustive list. Now how democratic is the UK government? And how influenced by big business? or influenced by big business, (or not) is the UK government? The House of Commons – the MPs of the UK parliament - are elected by the First Past the Post voting system, which bins millions of peoples’ votes unrepresented in every election, and lets parties get a majority of seats on a minority of votes (currently the Conservatives have 51% of MPs on 37% of votes) (8). In theory elected MPs appointed government ministers direct civil servants on what laws to make and parliament votes on whether to amend them, pass them or reject them. The House of Lords, though unelected, has little power in practice. It can only send a bill (draft law) back to the elected House of Commons (made up of MPs) twice, with suggested amendments (changes). If the Commons send the bill back a third time the Lords cannot vote against it, even if their amendments have been rejected. In practice the Lords have helped to prevent Prime Ministers with big majorities for their party in parliament rushing through laws before the public, MPs, or the media have had time to look at what those laws would do in detail – because many MPs just vote whatever way the party leader tells them to most of the time. The Prime Minister can appoint unelected members of the House of Lords to be government ministers, which is more dubious. A much more undemocratic – and arguably corrupt – factor - is that big banks and big companies that donate to party funds often second their employees to UK government departments. They then get to influence, write, or scrap, regulations for their industries. The four largest accountancy firms in the UK also routinely second staff to the Treasury, where they help draft tax laws. They then use the knowledge of tax laws and influence over them which they gain to help paid clients they advise (including big banks and companies) to avoid taxes (13) – (14). There are no laws preventing advisers or ministers taking jobs with firms they did favours for in government. And advisers to ministers and Prime ministers are not elected, but appointed. In itself advisers being unelected would not be a problem, if so many of them did not have close involvement with private companies who profit from advice they give ministers – and if they did not often then take jobs with those companies. For instance Sir Stuart Rose, an adviser to Health Secretary Jeremy Hunt, is also a paid member of the Board of Bridgepoint Capital – an investment firm which owns the majority of shares in the private healthcare firm Care UK (16). Mark Britnell, an adviser to Prime Minister David Cameron on health policy, told a meeting of private healthcare firm executives that the NHS would be shown “no mercy” and that this was a “big opportunity” for them (17). A year later he went into a job as a lobbyist for a company that lobbies on behalf of private healthcare companies (18). The former head of HMRC – the Treasury’s tax collecting body – Dave Hartnett, now has a job working for the HSBC bank (19). Under him HMRC let big banks and firms off with not paying large amounts of tax, without prosecution, in “sweetheart deals”, while aggressively prosecuting people on ordinary incomes for tax evasion (20). The Campaign Against the Arms’ Trade’s Revolving Door blog shows the many former Ministry of Defence Ministers, advisers and chiefs of staff who have gone on to jobs working in arms companies (21). Former Conservative Health Secretaries Stephen Dorrell and Andrew Lansley both went into jobs working for private healthcare firms after overseeing the contracting out of NHS services to private companies that donated to Conservative party funds (22) –(23). Before that New Labour Health Secretaries Patricia Hewitt and Alan Milburn similarly went into jobs with private healthcare firms after also overseeing ‘Public Private Partnership’ contracts going to private firms, and the contracting out of NHS services to private firms.(24). Again these are just examples, not every instance. There are no serious restrictions on political donations from big banks, big firms or the very wealthy to political parties. Banks and hedge funds provided over half of the donations to Conservative party funds in the run up to the 2010 election (25). The Coalition government including the Conservatives continued New Labour’s policy of massive Quantitative Easing of hundreds of billions of pounds, with every penny going only to private banks (26). In 2013 Mark Carney, a former executive at Goldman Sachs bank, was appointed Governor of the Bank of England (27). Between 2010 and the 2015 election super-rich hedge fund managers donated £10 million to the Conservative party (28). At the same time Chancellor George Osborne cut the top rate of tax from 28% to 20%, and abolished stamp duty reserve tax on asset management funds – which would include hedge funds (29). Leaving the EU without addressing these problems will not fix them. It’s private political donations and the revolving door between government and business that are undermining democracy at every level of government. The Leave Campaign’s leaders – Would they protect the NHS and stop TTIP? Leave campaigners Michael Gove MP, Daniel Hannan MEP and Nigel Farage MEP say they would increase NHS funding if we left the EU. Yet Gove and Hannan co-authored a book in 2009 which called the NHS “irrelevant to the modern world”. And Hannan told Fox News that the NHS was “a 60 year old mistake”. Farage has been caught twice saying the NHS should be replaced with private healthcare (31) – (33). Gove , Ian Duncan Smith and Boris Johnson are also members of a Conservative government slashing public health spending so it can say the NHS has “failed” and needs “reforms”, while promising “big opportunities” to private healthcare firms that donate to Conservative party funds (34) – (35). So are Cameron and Osborne, who are for staying in the EU, but Hannan and Gove’s previous statements suggests they would erode the NHS even more. Boris Johnson’s supposed opposition to the Transatlantic Trade and Investment Partnership is not credible when he wrote an article praising its “brilliance” in 2014. (36). So if Boris has his way he will probably just negotiate a TTIP style deal, but between the UK and the US rather than the EU and the US. Sovereignty here just means Boris and pals handing more power to big business. And these are the people likely to become Prime Minister and government ministers once David Cameron stands down (As he’s said he will before the next General Election) if we leave the EU. Of course many of the politicians campaigning for remaining in the EU are no more trustworthy – certainly not Cameron or Osborne. Conclusion – Leave or Remain in the EU? So the EU and the UK government both leave a lot to be desired. Both should be a lot more democratic than they are. Both are heavily influenced by big banks and big companies through donations to political parties and the revolving door of people going back and forth between government and big business. Which you choose is up to you. You may decide that getting rid of one level of bad government is an improvement. Or that there is no point in leaving one corrupt and not fully democratic layer of government just to give another that is just as bad more influence – and that remaining to push for reform of both is the best way.